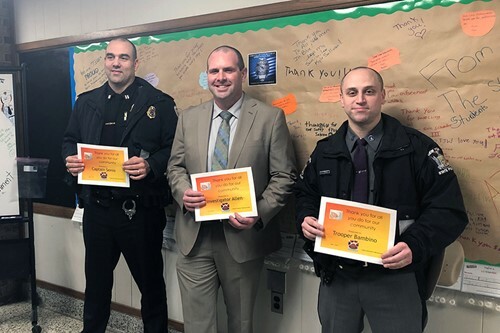 Recently, TJW Student Government invited several law enforcement officers to their school to show them the “Wall of Thanks” that was created by students to recognize the men and women in uniform. The wall was created in honor of Law Enforcement Appreciation Day, which was January 9. Students wrote notes, made cards and created special treats to show their thanks for all that law enforcement officers do to help keep our community safe. Thank you to the law enforcement officers who attended: Investigator Jeremiah Allen, NYS Police, who is the husband of first-grade teacher Marianne Allen; Trooper Phillip Bambino, NYS Police, who is the father of third-grade student Julianna Bambino, and Captain Michael Senio, Binghamton Police Department, who is the husband of fifth-grade teacher Emilee Senio.